Genital Integrity Awareness Week, or GIAW, has been celebrated annually during the last week of March since 1992. During the week, gatherings are held in cities and towns across the United States, with the largest gathering in Washington, D.C. There is a large demonstration/march on the West Lawn of the Capitol—as well as many informal get togethers with those in the genital integrity movement. During one such get together at GIAW 2014, Sandy Roman shares his thoughts about the circumcision issue (video courtesy of Circumcision Resources). When Brian and Sarah Kirkell saw a protest outside the American Academy of Pediatricians (AAP) Conference in Washington DC they shared their story of how they came to protect their son's genital integrity, and educate their daughter about genital autonomy too. 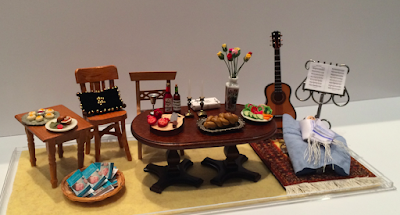 This adorable miniature diorama showing a brit shalom ceremony, crafted by Lisa Braver Moss, was front and center at our booth during the Union for Reform Judaism's Biennial. It served as a perfect icebreaker to get the conversation going. Being so involved in the circumcision issue, it’s easy for me to forget that many are still unaware of the anatomical facts, or even the controversies surrounding the practice. This was evident during my recent trip to the Union for Reform Judaism Biennial, held this year in Orlando, Florida. “Why would any parent want to opt out?” “Hasn’t it been proven healthier?” These were among the questions that Lisa Braver Moss and I encountered during the five-day event.